Hate is a strong word. I rarely use it. When I do use it, I make it clear that I do not use it in jest, or without reason. When I say I hate something, I mean I abhor it, I detest it, and I wish it were not in existence. Therefore, saying that I hate the prosperity gospel, I still feel I am putting it mildly. Frankly, I wish it would disappear never to deceive another Christian again. Without giving you a long, drawn-out definition, I will make it simple: the prosperity gospel convinces Christians that God wants them to be wealthy, that he does not want his children to suffer, and that he wants them to enjoy every moment of this life, because he promised he would bless those who have faith enough to believe he would do just that. In effect, the prosperity gospel does more than hurt Christian growth. The prosperity gospel attempts to deceive us into believing that with enough faith, we will inherit the blessings promised to Abraham, Isaac and Jacob, and by extension, the nation of Israel in this lifetime, which is simply not true. What is worse is that Christian ministries throughout North America are now exporting this health and wealth gospel to poorer nations, such as Africa, and walking away with millions of dollars in donations for what in reality is a lie. 1. The prosperity gospel negates Christ’s sacrifice. Jesus sacrificed his life in order to reconcile us with God (Ephesians 5:2; Hebrews 10:14). Up until Christ’s death, there was a need for a blood offering as a means to approach God’s throne (Exodus 30:10). Without that sin offering, which typically came in the form of an animal sacrifice performed by a representative of the Levitical priesthood (Leviticus 4:1-7), no one could request an audience with God directly. All that changed once Jesus died on the cross. No longer do we need to worry about our sins getting in the way of our relationship with God. Instead, we have Jesus, who bore the penalty of our sins, who now acts on our behalf as intercessor, drawing us nearer to God in a communion based on repentance and forgiveness (1 Timothy 2:5-6). In turn, God refers to us as sons, of whom the creation is eagerly waiting for the revealing of our inheritance (Romans 8:18-19). The prosperity gospel throws that all aside for the temporary hope of gaining riches now. Christ’s shed blood is meaningless in the context of our desire to petition God to grant wishes, as if he were some kind of genie. God is only there to serve, and if he does not give us what we want, then we did not ask him with enough faith, which cheapens what Jesus did for us because there would be no need for redemption if all we are looking for is a comfortable life without sickness. 2. The prosperity gospel does not recognize Christian suffering. When God began working with Job, one of the richest men of the Old Testament (Job 1:1-3, 8), he began doing so by allowing Job to lose everything (verses 13-19). God not only used Satan to permit Job’s suffering (verse 12), but he also used Job’s sense of loss to act as a contributing factor to bring about his repentance. Job came to realize just how awesome and wonderful God is, such that he accepted God’s greatness regardless if he understood, or not, why God did what he did (Job 42:1-6). Contrast this example with how the prosperity gospel interprets scripture. The prosperity gospel renders Job’s suffering as an example of the doubling-up principle detailed in Exodus, “If a man gives to his neighbor money or goods to keep safe, and it is stolen from the man’s house, then, if the thief is found, he shall pay double” (Exodus 22:7 ESV throughout). In Job’s case, the thief was Satan; and since Satan took all that Job had, Job’s compensation would be double his loss (Job 42:10). Saying it another way, Job’s suffering had nothing to do with repentance, but had everything to do with claiming a reward from a long-forgotten civil statute enacted in ancient Israel to discourage thievery. A couple of things are wrong with this thinking. First, when Job went through everything he did, the nation of Israel did not exist, therefore, the thievery statute, being part of the Law of Moses, did not exist. Second, and more importantly, it would be presumptuous to assume God’s intention when he allows people to suffer. It would be even a bigger mistake for others to deny that God allows suffering. In the New Testament, Jesus spoke many times about this life’s riches and the futility of trying to accumulate wealth (Luke 12:15-21). He even made it clear that the rich would have a hard time entering the kingdom of God, “Again I tell you, it is easier for a camel to go through the eye of a needle than for a rich person to enter the kingdom of God” (Matthew 19:24). In all that Jesus said, he guaranteed one thing: his followers would suffer for his name’s sake (John 15:20) and his apostles confirmed this understanding (1 Peter 4:12; 2 Timothy 3:12). He did not promise material wealth, but actually encouraged followers to sell everything to give to the poor (Matthew 19:21). 3. The prosperity gospel blames poverty on a lack of faith. People are poor because they want to be poor. In essence, that is the prosperity gospel message. People become sick and stay sick because they lack faith in God to heal them. After all, did not Jesus say, “Daughter, your faith has made you well; go in peace, and be healed of your disease” (Mark 5:34)? Yet when someone dies of cancer, is it because of a lack of faith that he or she died, or was it that God allowed it to happen for a greater purpose? The prosperity gospel answers this question by hinging its entire theology on faith. With enough faith, God will bless us Christians with health, wealth and happiness. If we hope for whatever we ask, we will receive it; and if we do not receive it, we did not hope for it enough. The problem with this type of thinking is that we make what we hope for our goal instead of asking God what his will is for us (Matthew 6:33). In fact, God’s will soon takes a backseat to our desires, which could run contrary to what he wants (James 4:2-3). For this reason, many Christians wonder why God allows things to happen the way they do, rather than trusting God’s ability to resolve things according to his will. There is nothing wrong with having faith, so long as we do not mistake it for materialistic faith, which leads nowhere other than against God’s plan. 4. The prosperity gospel guarantees a payback for anything Christians give. Imagine investing $100 and receiving $10,000 back. That is what the prosperity gospel will have us believe. Whatever money we give will come back to us a hundredfold: “Jesus said, ‘Truly, I say to you, there is no one who has left house or brothers or sisters or mother or father or children or lands, for my sake and for the gospel, who will not receive a hundredfold now in this time, houses and brothers and sisters and mothers and children and lands, with persecutions, and in the age to come eternal life'” (Mark 10:29-30). Other than the apostle John, historical evidence suggests all the apostles died by the hands of persecutors. What happened to their reward? Whatever became of their hundreds of houses they owned? As regarding to the mention of houses and lands, these verses are referring to families, much like how other parts of scripture refer to families by a patriarch’s name; such as the House of David (1 Samuel 20:16; 2 Samuel 3:1), the House of Judah (2 Samuel 2:4; 1 Kings 12:21), and the House of Jacob and Israel (Jeremiah 3:18; Hebrews 8:10). And should there be any confusion as to what Jesus was preaching, we need to read Mark 10:29-30 in context with the other verses surrounding the passage, starting from verse 17 all the way to verse 31. Jesus was saying that for the rich and wealthy, it would be difficult, almost impossible, for them to enter the kingdom of God, “And Jesus looked around and said to his disciples, ‘How difficult it will be for those who have wealth to enter the kingdom of God!’” (verse 23). Before that, he made it even clearer to a rich, young man what his stance was regarding riches, “And Jesus, looking at him, loved him, and said to him, ‘You lack one thing: go, sell all that you have and give to the poor, and you will have treasure in heaven; and come, follow me’” (verse 21). Other proponents of the prosperity gospel camp turn to the Old Testament to convince Christians to give generously: “Bring the full tithe into the storehouse, that there may be food in my house. And thereby put me to the test, says the Lord of hosts, if I will not open the windows of heaven for you and pour down for you a blessing until there is no more need” (Malachi 3:10). Again, should what Malachi say apply to Christians today, it does not refer to blessings now, although we may receive blessings but it may have more to do with God’s spontaneous generosity than with the verses written in Malachi (Matthew 6:3-4). God wants generous and cheerful givers (2 Corinthians 9:7). He does not want Christians giving with the expectation of getting something back in return (Proverbs 11:7). He does not want to limit us to give only a tithe, or rather, 10% of our increase either. Everything is his (Psalm 24:1). He wants to see just how much of what he gives to us do we dare keep. Jesus came as God in the flesh (John 1:1-3, 14), lived, died, and rose from the dead. He sits at the right hand of the father (Romans 8:34), waiting for the time when he will return as a conquering king (Hebrews 10:12-13). During his time on earth, Jesus taught about loving God and loving others more than himself (Mark 12:28-31; John 15:13). He healed the sick (Mark 1:34), taught forgiveness (Matthew 6:14) and instituted the Lord’s Supper as a memorial of his death and resurrection (Luke 22:17-20). Jesus willingly gave his life on the cross (Matthew 26:39), to save from the penalty of sin, which is death (Romans 6:23), all those who believe in him (John 3:17-18). Everyone who believes now has salvation through Christ’s sacrifice (John 3:16). This is the true gospel. My son is out of the hospital. I cannot express the joy my family felt two days after Christmas when the doctor told us we could finally take him home. It really was a miracle. We had thousands of people praying for him, and we, too, had asked God for his intervention. Imagine our surprise once we heard him speak again for the first time in a month. I am writing this post with the hope that one day it will help other families with autistic children recognize what an autistic shutdown actually is. Because when it happened to our son, we did not understand it. We thought we had done something wrong and we blamed ourselves. In truth, autistic shutdowns do happen, and they commonly happen to high-functioning autistics, much like it did to my son. The way it happened with our son was that one day, early November, he suddenly stopped. He stopped talking. He stopped looking around. He stopped doing anything for himself. He ate, but minimal. He held his elimination process until late at night when everyone had gone to bed. Most of the time, he sat in his bed and stared. If we tried to move him, he would stiffen. If we asked him questions, or talked to him, there would be no response. He seemed to be lost in his thoughts unable to break free from the state he was in. We initially thought depression was at the center of it all, but other than a few statements he had uttered before his shutdown, we had no other indication that could be the cause. Then we thought he might be experiencing some other form of mental illness. We had gone as far as trying our best to fix it ourselves, like we had done throughout his life. I mean, we are talking about a kid who grew up with many people around, wrote short stories, wrote music, learned how to swim, won a gold medal for Speech Arts at the Royal Conservatory of Music in Toronto, took part in recitals, went to college, and was thinking about getting a job. So for us, we have never seen this behavior before and that is why we had to get him to the hospital as soon as we could. We wanted to know what was happening to our son. Once at the hospital, medical doctors ran tests to rule out the most likely causes for his state. Blood and urine tests all came back negative, which was great, but we still did not know what was causing the catatonia and mutism. Doctors ordered a CT scan to detect if there were any anomalies residing in his brain. It came back clean. At that point, doctors sent my son to the mental health unit of the hospital, where he stayed until his discharge. Of the half-dozen psychiatrists who saw my son over a one-week period, three had formed opinions. One suspected he was bipolar, which did not make any sense to my wife Luana and I. My son had never shown emotional instability, where his highs were highs and his lows were lows. The second doctor believed my son suffered from depression. Again, we did not see any sign of it, considering months before his shutdown he was smiling and laughing. He would have his off days, but not to the point where every day was darkness to him. We would have known it. We were speaking frequently with him throughout the day. Finally, the third psychiatrist suggested my son was battling schizophrenia, news to which Luana and I felt like a cinder block had struck us in the head. No way was he schizophrenic, we thought. Yet, it was not until several days later that Luana found the symptoms to schizophrenia are much like those of Autism Spectrum Disorder. Nonetheless, the psychiatrist prescribed a treatment of Olanzapine. My son had never been on any medications throughout any part of his life, no less, anti-psychotics. The first 10mg dosage caused vomiting and diarrhea. The doctor lowered the dosage to 5mg daily. The expected result was that if he suffered from a psychosis (i.e. bipolar disorder, depression or schizophrenia), we would see a big difference with him. It did calm him, where he no longer resisted medical aid, but he had not broken from his catatonic state. That was what we were hoping, and it did not happen. He was on the medication for three weeks before the attending psychiatrist requested a family meeting with us to discuss next steps. In that meeting the doctor said, the medication was not working and would like us to consider ECT (Electroconvulsive therapy). The only exposure I had with ECT was with the movie One Flew Over the Cuckoo’s Nest, where the nurses used it as a form of punishment for when patients were not cooperating with their treatments. Naturally, I had my reservations. I learned, however, the treatment would work if, again, my son were suffering from a psychosis, from which Luana and I did not believe he suffered. Further to this, as one of the nurses explained to us, it would take a series of six to eight ECT sessions, to start, for the treatment to be effective. Even then, there may be monthly maintenance sessions my son would have to go through after discharge in order to ensure the symptoms of the psychosis do not return. Luana and I left the hospital devastated. For a week, we had no idea what to do. Around this time, Luana began reading about Lorazepam, a benzodiazepine meant to treat anxiety disorders. In independent clinical studies, the medication showed a marked improvement in autistic patients suffering from catatonia. The only drawback was that the medication was highly addictive and withdrawal could trigger seizures that could potentially prove dangerous or fatal in some patients. When we discussed this medication with the psychiatrist, we first expressed our concerns with ECT, that we wanted to exhaust the medicinal route first, leaving ECT as the last resort. Next, we worked out a treatment plan, signed a consent form, and requested to have 6mg of Lorazepam administered daily to our son over a 72-hour period. “Confess your faults one to another, and pray one for another, that ye may be healed. The effectual fervent prayer of a righteous man availeth much” (James 5:16 KJV). The afternoon after my son received his first dose of Lorazepam, Luana and I went to visit to see how he was doing. One of the nurses who had cared for him all these weeks stopped us in the hallway. She said that she had never seen him act the way he did before that day. He was smiling, speaking, and playing cards. It was as if something woke him up from whatever state he was in and he was participating in life again. All the nurses were talking about him, too. Because not only had they never had an autistic young man who was catatonic in their ward before, but they also had never seen such a stark change in someone, as it happened with our son. The psychiatrist quickly called us the next morning wanting to have another family meeting. We were at the hospital within the hour. He asked us what we wanted to do next. This was a couple of days before Christmas. We did not even have to think about it, since we had already discussed it before our meeting. We said that we wanted our son to stay in the hospital a few more days for observation. Luana and I wanted to make sure our son had healed from his catatonic state and he would still be talking once we brought him back home. The doctor agreed, and two days after Christmas, the hospital discharged my son. Wednesday will be two weeks that my son left the hospital. During this time, we managed to wean him off the medication ourselves by promoting a diet rich in GABA. Now that we have confirmed anxiety was the cause for his autistic shutdown, we are teaching him techniques that allow him to control his mental wellbeing on his own. Deep breathing exercises, resting, reading are de-stressor activities he now enjoys doing. Identifying the cause of the anxiety is still on our list of things to do. We also found he is not yet ready for crowds or people, at least, for long stretches of time. He does well with short visits, but anything longer than half-an-hour seems to cause him to regress into a protective state of staring and mutism that lasts upward to an hour. Twice this happened with him so far since he has been home. He is looking after his hygiene, but not without prompting from us. We had to show him how to shower again, brush his teeth and comb his hair. He has yet to allow us to cut his hair or trim his beard, which we believe is a sensitivity issue due to his autism. We discovered as well that he has a more pronounced desire to maintain a daily routine, something he was lacking last year due to all the changes that took place in the family schedule. For example, he came down to have breakfast yesterday morning without changing out of his PJ’s, because his clothes he needed to change into were not in their usual place. Overall, the autistic shutdown my son experienced has taught our family some valuable lessons I would like to share with you. Our autistic son thrives on predictability and routine. Should anything change, we would have to let him know in advance in order for him to adjust to the change. We keep the home quiet of blaring sounds and noise. For me, this was difficult. I am Italian and everything with me being Italian is loud. I have had to usher in a quiet peace in the home, which now is having a wonderful effect on my son. A soothing environment promotes wellbeing. Luana is slowly introducing GABA-rich food into our diet. GABA (Gamma-Aminobutyric Acid) is one of the body’s primary neurotransmitters that calm the central nervous system (CNS) of anxiety. Cherry tomatoes are high in GABA. Sleep now is a big thing in our family. At about 8:00PM, our family begins to wind down. This process also places our son in a frame of mind of wanting to go to sleep. The more rest he has, the better the next day will be. He will have good days and bad days. I have learned this, and there is not a thing I can do about it except accept it. Too much external stimulation lowers his ability to cope. I found that like a computer, my son’s brain could only deal with so much before it stops accepting things to process. I have had to learn to do one thing with him at a time. He does not multitask, at least, not for now. We ask him one question at a time, as well. We give him ample time to respond, and we do not answer the question for him, unless he has trouble expressing his words. We now speak to him with simple language and simple sentence structure. When we add multiple ideas in a sentence, we lose him. Therefore, one idea at a time, in the simplest terms, seems to work with him. As parents of an autistic child, we ought to know what his limitations are. Regrettably, our son does not know his own limitations. He may want to push himself beyond what he can handle, or do, and find himself at the edge of another autistic shutdown. We have replaced many of my son’s anxiety-driven activities (i.e. video games) with those that enhance a calm state of mind. Family board game nights and card games tend to bring us all together and give us a chance to bond. In the summer, we will be looking forward to a family vacation. We learned a lot about people while my son was in the hospital. There are those who placed blame on us for what happened to him. There are those who promised to visit him and did not. There are those who said they visited him and did not. Some people even went out of their way to tell us what was wrong with our family, not realizing their own families may one day have a similar situation happen to them, and they will be looking to us for comfort. And there are people we could not live without, who surprised us with their support, who comforted us with their kind words toward our son, who gave of their time to visit him when he was in the worst of conditions, who hugged, consoled and encouraged us when we were in a place we would not want anyone else to be in. To those people, I give you our gratitude and appreciation, for you have brought our family incredible joy we would otherwise not have had, had you not been there for him. Most importantly, Luana and I thank God for being there every step of the way. While the storms of trial swirled around us, God was our rock, our fortress and our salvation. He comforted us when we needed comfort, blessed us when we looked for answers, and guided us when everything appeared the darkest. God, through Jesus, gave us the hope we needed to move forward. He was the one who provided us with the strength we so truly searched. He, above all else, showed us the greatest compassion. God’s calling to forgive one another is just the beginning. His desire is to overwhelm people with his spirit so that a hardened heart may melt to become loving and generous. Above everything else, God wants a relationship with every person who hears his word. 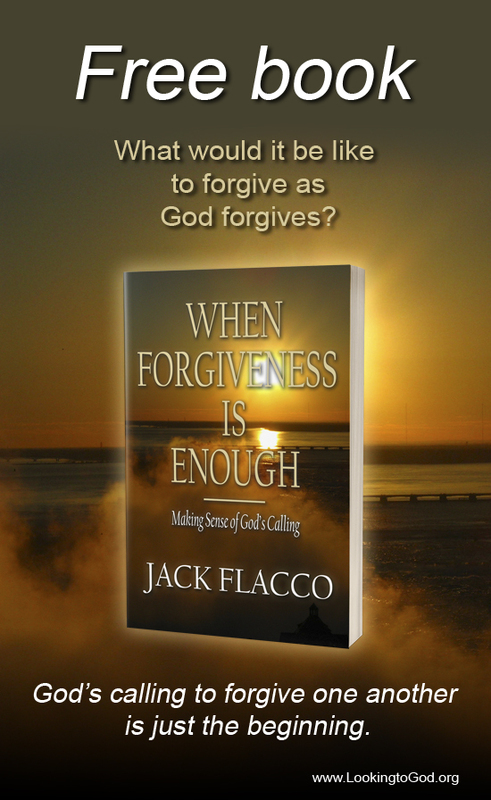 In this practical guide, Jack Flacco recounts the events that led to his transformation and explores techniques that has allowed him to overcome hatred, envy and resentment. Before I begin, I cannot say how thrilled I am to welcome summer. Because of this, I will be taking the next several months off and will be coming back in the fall with all-new articles. Until then, you can catch me on Twitter where I am updating my “Year of Thanks” tweets, and on Instagram where I am posting photos of life as it happens. What is it that makes some people jolly and others miserable? In fact, let me turn the question on its head. Does money buy happiness? After all, is that not what everyone looks to when thinking about being satisfied? I am sure that if you think about it for a moment, money is the furthest thought on your mind when it comes to happiness. Right? We all want love, joy, peace, comfort, none of which we can attain without first understanding what happiness is. Yes, I agree, but for how long? Once the newness fades, then what? I can see why some folks end up in a cycle of going to work, buying stuff, paying the bills for the stuff they bought, and going out to buy other stuff to protect their stuff. Meanwhile, as the home becomes fuller, life becomes emptier. This is why I would like you to think about this next question. Take your time and really think about it. If you want, you can leave a comment—or not. It is entirely up to you. This is all about you, and you really do not have to share a thing. Again, take your time to think about it. It all has to do with the perception of happiness. What do you perceive happiness being? I will start it off. For me, happiness is spending time with my family, sharing experiences with friends, and praying and listening to God. Add to that good food, travel, and fulfillment with everything else that I do, there you have a perfect composite of me enjoying life. I typically don’t write about God. I try to keep my topics light and free from controversy. I’ll write about other things instead, like morals, the law and what is right. But about the G-word, I’m never quite sure if I’ll say too little or if I’ll say too much. And I find it risky because I don’t want to alienate readers who read my blog for entertainment purposes only. However, there has been a development in my life. Last year this time, I had promised myself that I would read the Holy Bible from cover to cover. To keep me on track, I went ahead and entered a chronological reading plan into my phone that would remind me daily of my goal. I say chronological because there are various reading plans out there that allow a person to start reading the word in various ways. I chose chronological because I’ve always wanted to gain a historical perspective to the writings than simply reading it for literature. With that in mind, I’m happy to say that as of December 31, last year, I completed my goal of reading the Holy Bible from cover to cover. What can I say about the whole thing? I can only describe it as an experience. I learned there is a God. I learned God would not give me a test he doesn’t think I can handle. I learned that no matter how many times I sin, God would forgive me. I learned that I mean something to God and he will do anything to save me from the penalty of my sins. I learned that as smart as I think I am, God is smarter. I learned to be kind. I learned what real peace is all about. I learned to sleep better at night. I learned a lot more, but those are the big ones. Apart from the experience of historical reading, I gained a huge understanding regarding human nature. For instance, I found a whole book called Proverbs chalk full of golden nuggets of wisdom dedicated to dealing with human nature. One of my favorite sayings I picked up from the book is “Go to the ant, you sluggard.” It means those who are lazy should have a look at what the ant does. The ant harvests in the fall to live through the winter. It also means, like an ant, I should always stay busy. Hard to get into trouble when I’m busy. Yet, of all the things I’ve learned, I think loving God and loving others is the most important. I don’t want to sound preachy, but to me it made enough an impact to promote a change in how I act—a change noticeable in my writings and to others. At least, I hope it’s noticeable. Have you ever wanted to read something cover to cover but never had the opportunity to do so? If so, what?